Tom Sawyer, a young boy with imagination, lives with his aunt Polly, cousin Mary, and half-brother Sid, in the 1800s near the South. The book starts with Tom escaping from a whipping. Upon coming home later, Aunt Polly asks Tom if he went to school and he says yes, but Sid catches him, earning Tom the job to whitewash the fence, but escapes by cunningly making others do it. Tom passes the Thatcher house and sees the beautiful new girl, Becky. Tom meets Huckleberry Finn, the town’s despised and loved, and they decide to reconcile that evening at the graveyard. Reaching school late, Tom sits next to Becky as a penalty. Becky and Tom declare their love for each other, but Becky realizes that Tom loved Amy before her and becomes angry. Tom and Huckleberry witness the murder of Dr. Robinson, and are the only people who know that Injun Joe, the Native, truly killed the doctor. They run scared, making an oath not to tell anyone what happened. The next day, Potter is sent to jail, being blamed for the murder. Needing some alone time, Tom, Joe Harper, and Huckleberry go to an island for three days. At school, Tom takes a beating for Becky, making Becky forgive. Soon, it is the day of Potter’s trial, and Tom admits that Injun Joe was the murderer. The next day, Tom and Becky go to the cave, and find Injun Joe dead. Huckleberry finds a home, and then joins Tom’s gang. When I first saw this book, I figured out in the first few chapters that this book had an accent and words that was a bit unfamiliar, but could understand. The book became harder as it progressed as the author knew where the reader should analyze what was going on. The good part about this book was that it gave perspective to life and learning as well as successfully describing older times and settings. A weakness to this novel is that since it is in the classic version, parts were in Oldern English, making it harder to understand. Another factor was that this book was in third person omniscient making it a little complicated to know who was feeling what and when. Overall, I would say this book should be for eighth to ninth graders. I would rate this book eight out of ten stars as it is a funny and amazing book if the reader is able to understand what is going on throughout the story. 1. What are Tom’s characteristics? 1a. 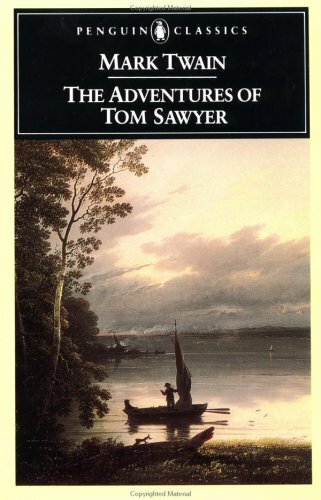 Tom Sawyer is a very temperamental person and his attitude varies in this part, as when he is with his aunt, he has no manners, but when he runs to school and church, the author depicts him with feelings and a lot more considerate. He is imaginative and also very mischievous. 2. How is Tom’s aunt in the manner of teaching and treating Tom, and what is her character portray? And how does Tom make Aunt Polly feel bad and sorry? 2a. Tom’s aunt does not discipline him very well and lets him go off the hook. Aunt Polly is a kindhearted person who lives life simply with morals such as love and appreciation. She worries about Tom’s safety, but also never wants to restrain Tom too much from anything knowing about his wild imagination. Tom makes Aunt Polly feel bad by usually sitting in a corner with a sad and long face knowing that Aunt Polly would let him go. 3. How does Tom feel about Becky and Amy Lawrence? How does Becky react? 3a. Tom fancies Amy Lawrence and tried to impress her, and used to like her. Becky is his new crush, and wants her to stay with him. Tom has now fallen in love with Becky and wants her to “engage” him and Becky is extremely happy until she realizes that Tom had been “engaged” to Amy Lawrence before her. 4. How does Tom feel about church and spirits? 4a. Tom decided that church was important and a way for him to get blessings and keep him whole. He believes in spirits and spiritual things, good and bad. 5. What does Tom go with Huckleberry to do? What happened at night when Tom went with Huckleberry to the graveyard which they witnessed? 5a. Tom goes with Huckleberry Finn to find a “cure” for warts. At the graveyard, they both witnessed the murder of Dr. Robinson by the Native-American Injun Joe. There was a fight going on between three people – Dr. Robinson, Injun Joe, and Muff Potter. Dr. Robinson knocked Injun Joe down and then got attacked by a drunk Potter who wanted more money. He uses Hoss Williams’s headstone to defend himself, knocking Potter unconscious. During that, Injun Joe stabs Dr. Robinson with Potter’s knife, for revenge from when he had gone to Dr. Robinson’s house for help but had been rejected. 6. What do Tom Sawyer and Huckleberry Finn do after seeing the scene at the graveyard and why? What happened in the morning and when he went back home, and how does his sorrow increase? 6a. Tom and Huckleberry Finn run away and swear a blood oath not to tell anyone what they have seen at the graveyard. The do this because they are scared and were worried if Injun Joe would not mercy them. The boys run to a deserted tannery and hide, unaware of Injun Joe’s plot to blame Potter for the murder. When returning home, Tom Sawyer did not know that his half-brother Sid was pretending to be asleep and was actually awake. In the morning, Sid had told Aunt Polly, and Aunt Polly had not flogged him, but said that Tom Sawyer could continue and break her heart and lead her to her grave through sorrow. Tom goes to school feeling dejected, but that only increases when he finds the brass andiron knob he tried to give Becky the day before on his desk. 7. Who had received the blame for the murder and how? How does Tom feel and what does he do? Is Tom being suspected? 7a. The night when the murder had occurred, Potter awoke and asked Injun Joe what had happened. Injun Joe told the drunk Potter that Potter had murdered Dr. Robinson in a drunken fury, and Potter, still dazed, believes him. Injun Joe promises not to tell anyone about the crime, but notes smugly that Potter’s knife remains stuck in the corpse. The day after, townspeople find the knife in Dr. Robinson’s dead corpse, and to everyone’s shock, Injun describes how Potter had killed Dr. Robinson. Potter gets out in jail. Tom feels terrible and stays up at night thinking about the murder. Sid becomes suspicious, but Aunt Polly says that everyone has been having nightmares which satisfies Sid. Tom, feeling bad, tried to give as many gifts and consolement to the “murderer” as he felt terrible adding more to his plate than he needed. 8. What happened to Tom and what did Aunt Polly try to do? What happens at school causing Tom to go back on his old impulse? 8a. Becky Thatcher falls ill and stops coming to school. Tom’s depression worsens, so much so that Aunt Polly begins to worry about his health. She gives him an awful-tasting serum called “Pain-killer.” Tom finds this last treatment so intolerable that he feeds it to the cat, which reacts with extreme hyperactivity. Aunt Polly discovers what Tom has done, but she begins to realize that “what was cruelty to a cat might be cruelty to a boy, too,” and sends him off to school without punishment. Becky finally returns to school that morning, but she disses Tom completely. Feeling mistreated, Tom resolves to act on his earlier impulse to become a pirate. He meets Joe Harper, who is likewise disaffected because his mother has wrongly accused and punished him for stealing cream. They find Huckleberry Finn, always up for a new adventure, and the three agree to slip away to Jackson’s Island, an uninhabited, forested isle three miles downriver from St. Petersburg. 9. Who supposedly drowns and what does Tom do to confirm his suspicions? 9a. Near the afternoon of their second day, they realize that the townspeople have thought that they drowned and that people must be missing them. To confirm this, Tom goes swimming back to his aunt’s home and does indeed figure out that his aunt and Joe’s mother are repentant and feel terrible about all they had done. 10. What goes on between Becky and Tom? 11. What happens at Potter’s trial? 11a. Muff Potter’s trial approaches, and Tom and Huck think about whether they should reveal what they know to the judge. They agree that Injun Joe would kill them, so they continue to help Potter in small ways, like giving him tobacco. The trial finally arrives, and Injun Joe gives his account of the events. Potter’s lawyer calls Tom Sawyer as a witness for the defense, much to everyone’s amazement. Tom feeling deeply frightened takes the witness stand and tells the court what he saw that night. When he reaches to the part where Injun Joe stabs the doctor, Injun Joe leaps from his seat and escapes through a window. 12. What does Tom want to do with his treasure if he receives any? How does Huckleberry Finn react to this? 12a. Tom Sawyer wants to spend his money and treasure on few small things but mostly on to get married. He only wants a red necktie, new drum, sword, and a bull dog pup as the small tokens from finding so much treasure. But the true award that he wants would be to get married as he has tried to get “engaged.” Huckleberry Finn finds this very absurd and only wants ­to have soda every day and go to the circus every time it comes as when his father comes he would take everything away. 13. Who is the “dumb and deaf” Spaniard who came around once or twice, and what do him and his friend talk about? 13a. The supposed dumb and deaf Spaniard is actually Injun Joe. They planned to do something dangerous, which in turn, made Tom and Huckleberry think it was related to them. 14. What happens to Tom and Becky and their picnic? 14a. They had gone the wrong way and lost their way. Tom’s fear of meeting Injun Joe again was evident in his fright weakened muscles and trembling body, and also making sure that Becky would never have to see Injun Joe and meet his wrath. 15. What happens when the news that Injun Joe was in the same cave that the townspeople had rescued Tom and Becky from is let out? 15a. Many people set out towards the cave, reaching it and seeing the cave door locked. When they unlocked it, they saw Injun Joe stretched on the ground dead with his eyes open with longing in the light and cheer outside as his last thought and sight. The place was in terrible condition, but what could be seen was the Injun Joe tried to live as far as he could go mentally and physically. 16. What happens when Huckleberry Finn and Tom go back to the cave and what is the effect of that? What does Tom say that Huckleberry has to do? 16a. They find lots of treasure, and upon this, everyone pities Huckleberry as he has no one with him as family to share joy, so the widow kindly takes him in. Huckleberry feels that this was too proper for him and decided to leave but say bye to Tom Sawyer and still ask if he can remain in the gang. Tom Sawyer says that if he at least tries to stay with the widow he could stay in the gang and that is agreed upon finishing the story.